It smells like a new car. But better. It’s also the first time since I began aviating in 2001 that I climbed into a brand new aeroplane and took off. Gushing time. First, the plane was only registered two weeks ago in South Africa, having been flown out here by a US pilot with a spare rubber tank which gave it over 6 hours airtime. I remember being around when a previous Cirrus flew in and the delivery pilot got himself in big trouble because he hadn’t checked clearance out of Botswana airspace into South Africa. The SA Air Force was not impressed. He escaped arrest – only just. This time there weren’t any glitches. ZS-CTP has all the trimmings. AWACS weather warning. Anti-collision system. An AIR CONDITIONER which is almost unheard of in most light aircraft because they’re so heavy and eat up too much power. In this plane you switch off aircon before the ground roll or bad things happen on take off. It’s simpler than it looks. When you’re up up and away the natural fan in the front is your aircon. But waiting at Lanseria in midsummer without an aircon inside a glasshouse in the holding bay doing the checks can be extremely sweaty and tiring so the cooling wind blowing through the plane helps concentration and increases energy. The new Cirrus SR-20 is quite different from its predecessors. It’s more than six inches higher for one, which doesn’t sound like much until you stand at the cowling to check the oil. Usually I can stare into the engine and take a hard look inside, but the new higher model means its up on tip-toes. The decision to lift the plane has come after numerous prop strikes with the older versions and the design was altered to ensure that if there’s a hard landing, at least its Hartzell $11 000 propellor won’t hit the runway. The two things I love about the new Cirrus are its feel and its Garmin G1000. I’m used to old planes which are a bit like old machines of any sort. The older they get, the more play in the controls. This plane is as tight as a Scottish referendum. 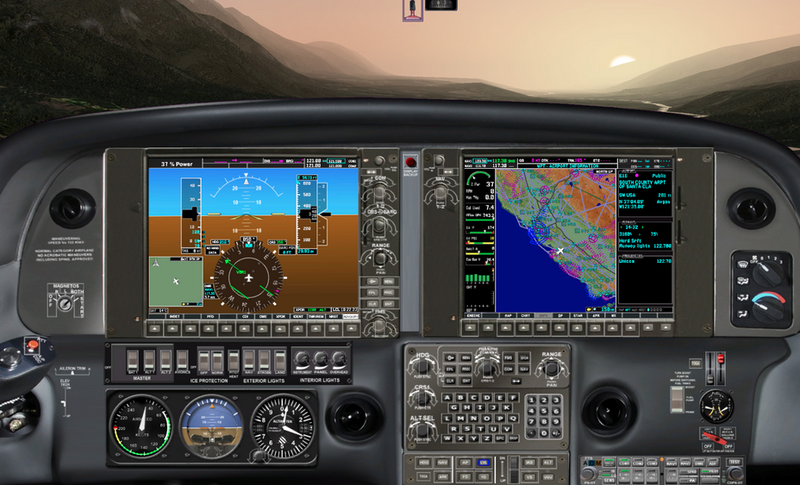 Garmin G1000 – PFD on left, MFD on right. The Garmin is not just a GPS. 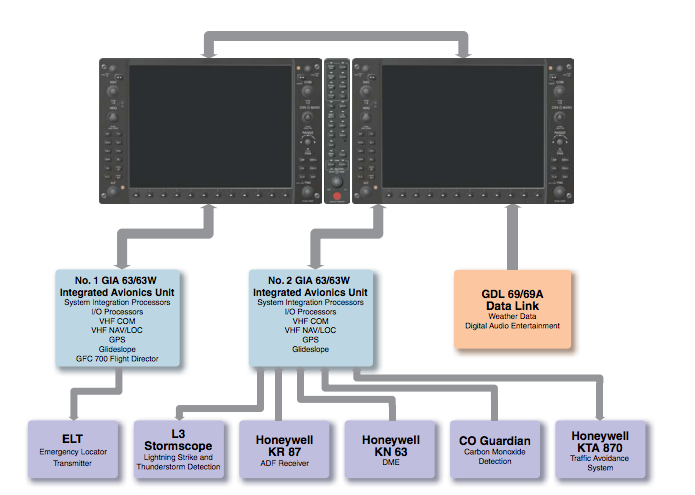 It’s a fully fledged avionics package with terrain avoidance, engine monitoring, autopilot and weather reporting. Russell Donaldson (total airtime > 28000) jumped in the right seat and showed me the ropes. You can’t fly this plane and its updated package without a 1-1 session with an instructor, the computerisation is so advanced. It’s split in two parts. 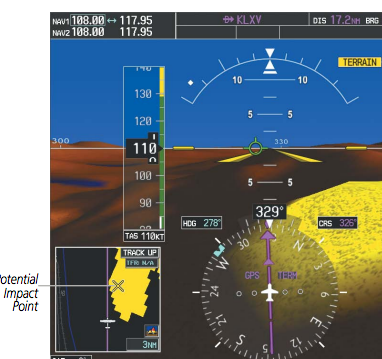 The Primary Flight Display or PFD on the left and Multi-Function Display or MFD on the right. As you can see from the image courtesy of Garmin, there’s a lot to take in. But compared to some digital displays, this just seems to make sense when you’re galavanting around. This blog doesn’t have the space to capture all the elements (the Garmin handbook for example is over 600 pages! ), however after using both the Avidyne and the Garmin G1000, I prefer the latter. Avidyne users are vociferous in their support, so I guess its all subjective. It took ten minutes to be shown around the innards of the PFD. I found that having used the Cirrus Avidyne glass cockpit previously, the Garmin pretty much came naturally. Russell patiently went through the comms and nav setup, with the GPS, VOR and RMI all selected using the same selector. The brakes on ZS-CTP were new and sharper, so I was careful not to over brake as we headed up Alpha to the holding bay. The wind which had been blowing at around 19kts dropped to around 5kts by the mid-afternoon. The check list can be “barged” 0r parts that are done through the usual mental/memory can be skipped like the post fire-up and pre-taxying. However, the usual engine run up and Too Many Pilots Go Flying In Heaven Early checks are always doubled – first I do it by rote, then by the selector check list on the panel. It’s always good to make sure. The take off was inspiring with the rotation smooth as silk and power at hand. It’s not surprising as I’ve been flying planes that are older- most well over 4000 hours logged, while ZS CTP had only 66 on its Hobbes. An hour of flying by instruments as the visibility dropped, and heading back via the tracking station, it was time to go home. But one thing’s for sure. I’m looking forward to more flying using ZS CTP over the next few weeks – in spite of the increased cost. It’s R300 more per hour to fly, but when you’re enjoying the increased instrumentation and the tight setup, its worth the extra Madibas. This entry was posted in Uncategorized and tagged Avidyne, Cirrus, Garmin G1000, Lanseria by desmondlatham. Bookmark the permalink.